Printed and bound by the artist, it is a singular treat for the knowledgeable collector of photographs. 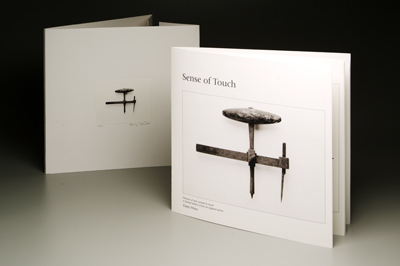 This bound portfolio is printed by the very same technique used to make the fine art inkjet (giclée) prints hung on gallery walls for exhibit and purchased by collectors. It is a custom made book with image quality far exceeding anything possible by conventional press work because these are original prints made by the photographer. Perfect-bound, this volume’s generous 12 by 12 inch page size allows the images to be printed on a large enough scale to involve the viewer while allowing an intimate art experience possible only with a work of art that can be held in the hand. There are sixteen pages with nine pigment print (giclée) images in a clean, classic layout. Explanatory captions and the artist’s statement about the photographs and the history of the series are on facing pages. A custom-made protective cover with a five inch square print (also signed, numbered and dated by the artist) and a letter of authenticity are included. The inks are the celebrated Epson Ultrachrome permanent pigments and the paper is Moab Entrada 100% rag, lignin free and acid free. This paper has a subtle natural tone because it is free of bleaching agents, while the black and white prints have an understated warmth that brings out tonal and textural values. Please be aware that because these books and their jackets are collated, scored, folded, and bound by hand, there may be minor irregularities present in each copy. The contents will be uniform throughout the edition. See two sample spreads in PDF format by clicking here.